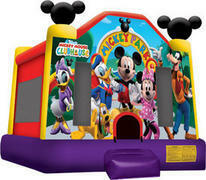 This licensed Mickey Park bounce house is perfert for your next party. This medium size jump house features Mickey, Minne, Daffy, Daisy, Goofy and off course the pup, Pluto. This unit is the most popular amongst kids no wonder we are the best party people in Sacramento, CA. Everyone love's Mickey and Friends!